Also, I am pleased to announce that this month’s meeting will celebrate our new scholarship recipients. These ladies have worked hard to accomplish their academic and professional goals, and with your help, they will continue to do so. Congratulations to the “fantabulous” scholarship committee on their efforts and selections. Finally, I just wanted to thank the many individual members for their continuing offer to do, assist and handle details. Several of you contacted me directly and asked if there was anything that they could do to assist. It’s so awesome that despite your busy schedules, you continue to give of your time. And , finally, a big hug and a thanks to Debbie Hartman, our all-around great administrative support-er. I know that we are not the only association that she supports, but she has never, ever said “No can do” to a request. She is the hub for our revolving wheel of activities! Well, that’s it from me. Thanks for putting your faith in me this year. It was fun. Have a great summer! Our June 8 luncheon will be a celebration of the future. The Scholarship committee will present the scholarship recipients for 2015-2016. The Nominating Committee will present and request a vote on the slate of officers for next year. We will also recap some of the highlights from our 25th year. Please RSVP for this celebratory meeting. 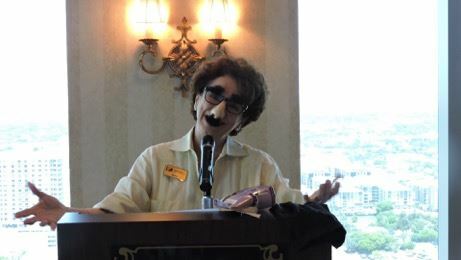 Thanks to Jill Beach for taking some great photos of Maria Soldani's hilarious presentation last month. Eileen O'Connor tells us that the Lighthouse of Broward will be the featured non profit at the Fort Lauderdale Starlight Musicals at Holiday Park on July 10. They have lots of great raffle prizes including gift certificates to the Sea Watch Restaurant, The Miami Seaquarium, Ruth’s Chris Steakhouse, Kelly's Landing, and many more. Volunteers are needed at the event. Call Tranique at 954-463-4217. Duree Ross was recently recognized as a 2015 Influential Business Woman by South Florida Business Journal. She received the award on May 21 at the Influential Business Women Awards. The event recognizes the top 26 most influential business women in South Florida who have made unique contributions to the community and business world. BoomerTimes announces the 14th "One & Only" Sizzlin' Boomer Expo at Seminole Hard Rock Hotel & Casino on Tuesday, July 28th from 10 to 4. This free event is dedicated to Veterans of all wars, with 4 cash prizes of $250 to the lucky vets. Exhibitors are encouraged to participate and meet and greet the 2,000+ attendees. It is the summer's major event for 50+ ers! For information call Anita Finley at 561 758 0299. A speccial thank you for a job well done to Tracy Carroll, Catalina Avalos, Jillian Krueger Printz, Barbara Van Voast, Holly Moody and Ivette Sanchez for serving on the scholarship committee.